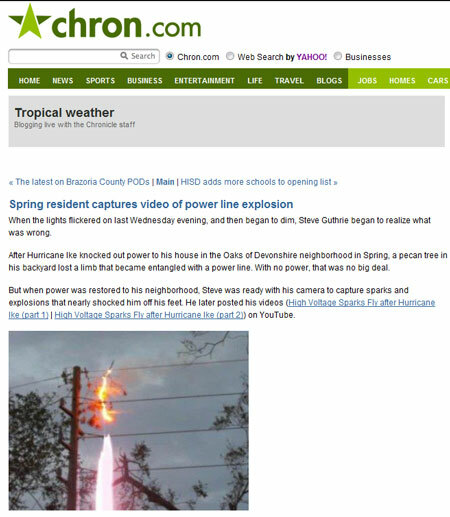 Today, an article I wrote appeared on Tropical Storms / Hurricanes blog on Chron.com. For the article, I interviewed Spring resident Steve Guthrie, who was in the right place at the right time with a video camera to capture a power line explosion following Hurricane Ike. This story was published on the Chron.com Hurricanes blog following Hurricane Ike. When the lights flickered on last Wednesday evening, and then began to dim, Steve Guthrie began to realize what was wrong. After Hurricane Ike knocked out power to his house in the Oaks of Devonshire neighborhood in Spring, a pecan tree in his backyard lost a limb that became entangled with a power line. With no power, that was no big deal. But when power was restored to his neighborhood, Steve was ready with his camera to capture sparks and explosions that nearly shocked him off his feet. He later posted his videos on YouTube.